It’s perfect for every season, every kitchen or bath and every decor style! 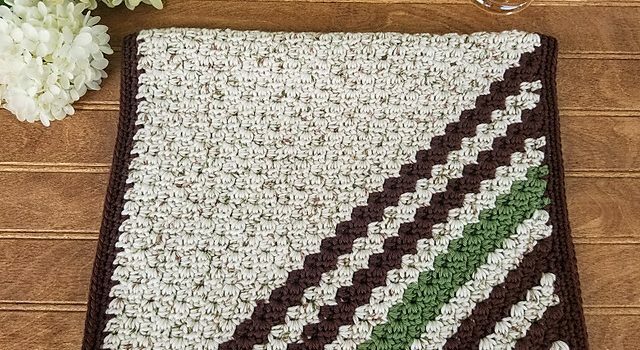 Striped Hand Towel by Erica Fedor is a crocheted using the mini corner to corner (C2C) method, and makes wonderful housewarming, hostess, or holiday gifts. Easy to customize in your preferred colors, this crochet towel with a classy look is absolutely beautiful! G/6 (4.25 mm) hook – my favorite crochet hooks that I use daily! These Crochet Kitchen Towels Are Gorgeous! Get the free crochet pattern here: Striped Hand Towel Free Crochet Pattern. Thanks to Erica Fedor for the article inspiration and featured image.